It doesn’t take long to notice that food is the passion at Phillies Bridge Farm Project in Gardiner, New York. The aptly-named farm sits in the middle of Phillies Bridge Road, the Sunset Strip of Gardiner farms. Boasting an impressive 65 acres, the farm has been protected through a land trust since 2002. Phillies Bridge is a Not-for- Profit, and, while the Board of Directors helps with fundraising and fiscal management, the creativity of the farm rests in the hands of six young women. Farm manager Anne Eschenroeder is not new to farming. 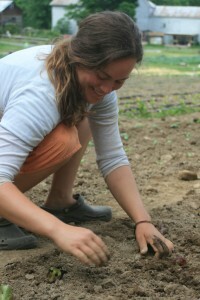 Between earning a certificate in Ecological Horticulture from the University of California Santa Cruz and an undergraduate degree in Environmental Studies (and Anthropology), the girl knows a thing or two about dirt. She manages the farm’s CSA of 220 members, deliveries to seven different restaurants, and the six acres that make it all possible. On my visit Anne was hurriedly cooking lunch for me and her interns. It turns out she knows a thing or two about cooking her vegetables as well. I should have known that when two farm ladies and their very experienced team of apprentices say “Lets eat,” I would be leaving with a very full stomach. 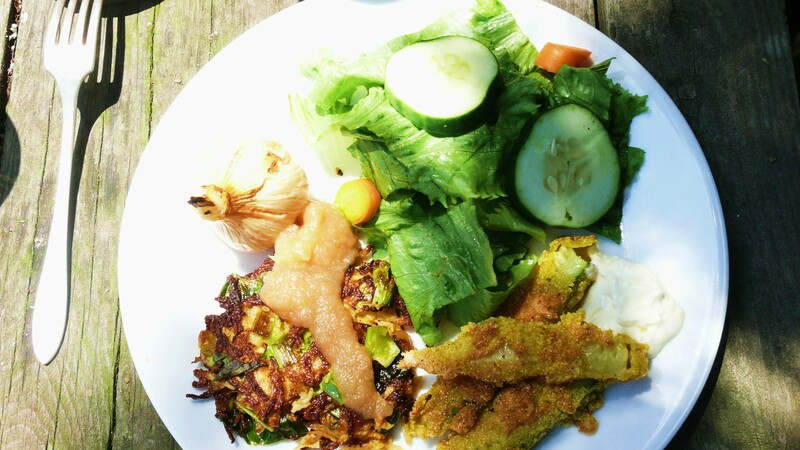 It was intern Katie’s birthday, and Anne prepared a very farm-filled meal of fried zucchini with sour cream, crispy zucchini latkes with applesauce, and a big garden salad with cucumbers and carrots. It is a Phillies Bridge tradition to eat together at noon, and, as one intern jokes, “It is the most important part of the day. It is what I work towards in the morning”. 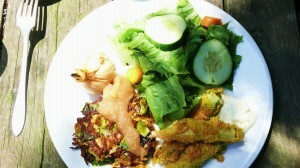 Anne pulled more fritters out of the kitchen, and more and more latkes appeared. We all took two or three helpings of each. Through forkfuls, I asked what the most difficult part of being a young farmer is. All six agreed that finding secure land and guidance is hard, as a big wave of young people are initiating this agricultural renaissance: “It is just hard to know what to do.” Amie also notes that it is really difficult for a young farmer to find a balance between work and life that will leave them emotionally and physically stable. She has farmer friends who work so hard in July that they end up loosing that balance and hurting themselves in the process. These young women are hopeful for all of us young farmers, and the only advice they have is to “just do it.” They all laugh at the marketing connotation of this phrase, but it seems to sum it up perfectly. They say that to be a success, you just have to get involved and try. Take classes. Read books. Go online. After lunch, the farmers quickly dart off to their individual tasks for the afternoon and I join Mary-Kate and Amie for herbal tea and zucchini bread with the kids. The children tell me in unison that there is “Lemon Balm!” and “Chamomile!” and “FENNEL!” (they were particularly excited about the fennel) in their tea this afternoon. As I make my way towards the parking lot, belly full and pad full of notes, I hear Amie lead the kids in a thank-you song. Twenty little voices sing “Blessings on the fruiiit, and Blessings for the treeeees”. Phillies Bridge Farm Project is more than your average farm. These creative women know food and want to share their knowledge with anyone keen on learning. And what did Katie get for her birthday? A garden-patch cake and Eliot Coleman’s New Organic Grower. Naturally! Cut the Zucchini in half lengthwise and cut each half again lengthwise, so you have 4 quarters. Dip each quarter into the flour. Shake. Dip each into the egg and allow the excess egg to drip off. Dip each into the bread crumbs and place the breaded zucchini on a plate or tray. 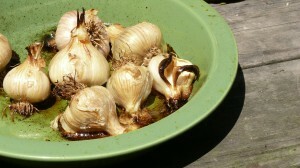 In a medium frying pan, heat the oil until very hot. Add the zucchini and adjust the heat to med-high. Using a slotted spatula or tongs, move the zucchini to a plate covered in paper towel. Sprinkle salt and thyme leaves over the hot zucchini. Serve with sour cream loosened with a little water for dipping.